SLC Designs; British designer unique jade, freshwater pearl, emerald and antique glass bead bracelets. Midnight Sparkle and Pearls Bracelet. The closure on this bracelet is a Swarovski crystal button. 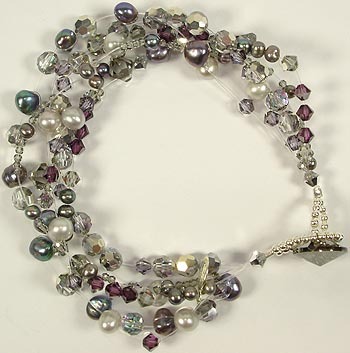 Sterling silver and Swarovski crystal, silver-lined Venetian-glass rocailles/ seed and a variety of silver and peacock-black freshwater pearls - the bracelet is made using 'illusion thread' so it has the appearance of the beads being strung on nothing. Metropolitan Bracelet; this reminds me of my trip to NY last year…not sure why…anyway. Handmade silver-lined Murano glass 'lentil' shapes, Swarovski crystal, silver lined rocailles (seed beads), sterling silver, a Swarovski crystal button closure and Snowflake Obsidian lentils, the bracelet measures approx. 9 inches / 22.5cm (you need extra length of this bracelet to be able to pull the button through the closure - the bracelet fits average wrists). Midnight Butterflies Bracelet; shining black Swarovski crystal butterflies flutter around your wrist with Swarovski crystal bead dangles on multiple chains which give lots of movement, a fairtrade fine silver (higher silver content than sterling) butterfly and hand-hammered ring with a sterling silver heart detail toggle clasp- the bracelet measures approx. 7½ inches/ 19 cm.